On se retrouve aujourd'hui pour le deuxième thème du défi Girls To Go ! Ce coup-ci comme vous l'aurez probablement deviné, le thème était la chemise en jeans. L'occasion pour moi de ressortir ma jupe en jeans préférée et de tenter le total look, alors défi réussi ? N'oubliez pas d'aller jeter un oeil au look des copines Filiz (And God Created Elvis) et Alessia (Drink & Lipstick) ! Here is the second round of Girls To Go ! As you probably guessed, the theme was the denim shirt. It was the perfect occasion for me to go for a all denim look with my favorite skirt ! Don't forget to check the outfits of my friends Filiz (And God Created Elvis) et Alessia (Drink & Lipstick) ! look au top! Le chapeau j'adooooore! wow, that's so cool! at first I thought you were wearing a denim dress. it just looked so fluent on you! but since the name of the post said something else I took a closer look. 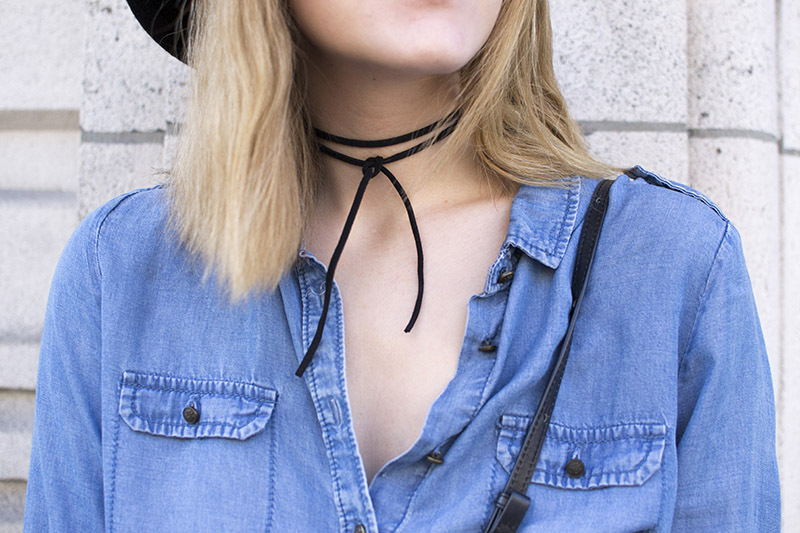 blue denim looks really awesome with the all black accessories, especially that choker again. once again a wonderful look from you! Défi plus que réussi! Je ne suis pas toujours fan du total look jeans mais ici, la jupe et la chemise, ça fonctionne! :) Et la jupe est vraiment super jolie! J'aime beaucoup! he denim on denim look is fab!! J'adore tellement cette jupe H&M ! Défi total look plus que réussit ! J'adore, j'adore et J'adore. Love this so much. I think it's cute how your shirt & skirt pairing makes it look like a full denim dress, but I especially love that patchwork jean skirt! Great styling with the black accessories too. I love your denim look ! So beautiful ! Cette jupe est canon!! 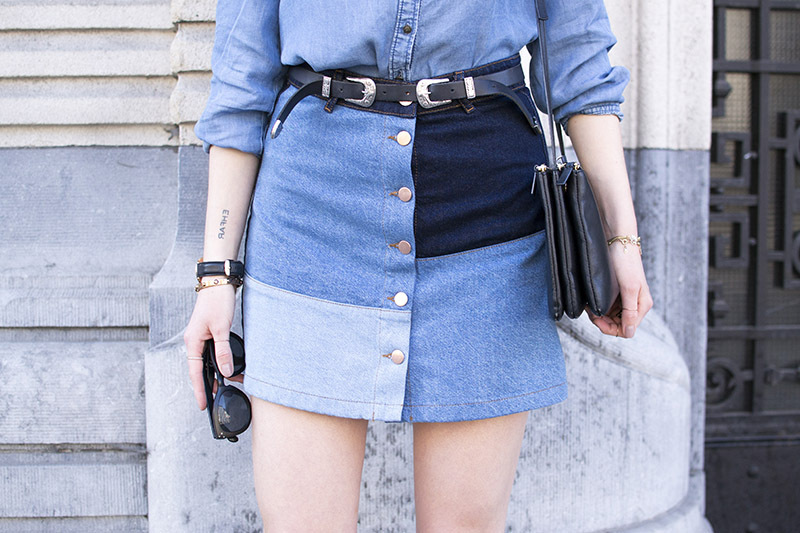 J'adore le look total denim! Canon ! Ce look te va trop bien ! Ce total look jean est top :) ! J'aime bcp la jupe et cet espace de patchwork :p.
CANOOOON ! ♥ J'adore !